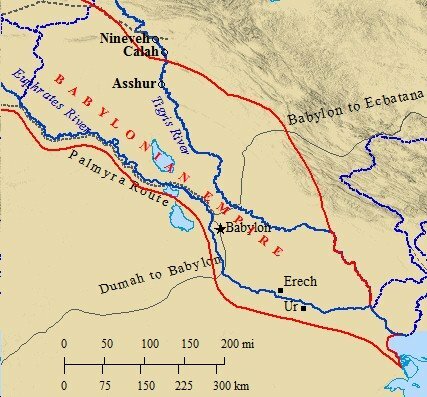 Any look at a map of ancient Mesopotamia and one will see many similarities between the two lands.The land of Israel is interconnected with the land of Mesopotamia. Both lands were dominated by at least one major river. The land of Canaan depended mightily on the Jordan River. 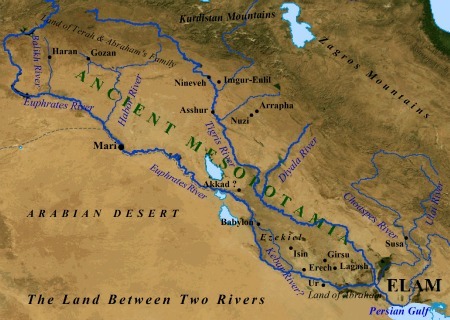 The map of Mesopotamia shows how civilization sprang up along the banks of the Tigris and Euphrates rivers. It also makes clear why the land earned the nickname; The Land Between Two Rivers. The Tigris & Euphrates rivers have shaped the course of history for this region. The earliest civilization known to man sprang up seemingly overnight in Southern Mesopotamia. The Sumerians were one of the most advanced civilizations of antiquity, and historians are quite at a loss to explain their origins. A MAP OF ANCIENT MESOPOTAMIA DETAILING THE MANY CITIES LOCATED IN THE SOUTH. Click on a link to view that map of ancient Mesopotamia. The patriarch Abraham was called from the city of Ur, located in southern Mesopotamia. The map of ancient Mesopotamia is dotted with cities along the southern parts. It was here the Sumerians established their sophisticated and advanced civilization around 3000 B.C. The great prophet Ezekiel is believed to have written many of his prophecies along the banks of the Kebar/Chebar river while in exile. Aram-Naharaim was host to many of the early patriarchs, such as Abraham and his father Terah, as well as Isaac and Jacob. In fact, many cities in this region bear similarity in name to Abraham and his family members. It was along the banks of the Tigris and Euphrates rivers that The Fertile Crescent ran in a northwestern direction. The land between the two rivers and the Persian Gulf forms a marshland. This region has remained as such since ancient times. 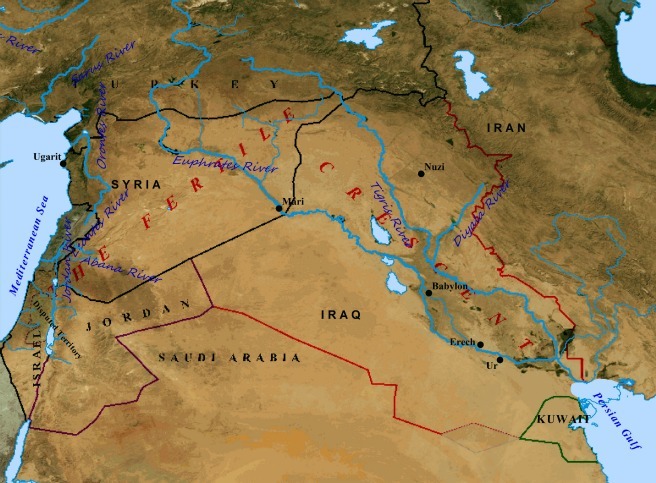 A geographical map of ancient Mesopotamia will show the Fertile Crescent starting in the south, and running to the northwest from there, splitting the Tigris and Euphrates rivers on its way. The Crescent ran along the fringes of the Zagros and Kurdistan Mountain Ranges, then bends westward, running along southern Turkey towards the Mediterranean Sea. At the coast of the Mediterranean, the Fertile Crescent heads southward. Running along the eastern Mediterranean coast, the Fertile Crescent pierces a narrow strip of land caught in the struggle between mountains/highlands to the east, and the Great Sea to the west. This narrow strip of land is known as the Levant. Ancient Syria formed the northern borders of the Levant, while Palestine formed the southernmost limits. Thus, any map of ancient Mesopotamia and ancient Palestine show the connection these two countries had to the land, and the resources of its great rivers. The Tigris and Euphrates rivers flood annually. Unlike the Nile, however, the flooding of these rivers was unpredictable. At times the rivers provided inadequate waters, other times violent floods. The people, thus, were fascinated with the flooding waters of the Tigris and Euphrates. Ancient Mesopotamian flood stories, such as the Epic of Gilgamesh, were common. In the case of the latter, many similarities have been found between this story and the Genesis flood. THE SUMERIANS WERE EXTREMELY ADVANCED, INVENTING MANY ELEMENTS OF OUR SOCIETY TODAY. THEIR ORIGINS ARE UNKNOWN, THOUGH THEY LIVED IN SOUTHERN MESOPOTAMIA. AMONG THE SUMERIANS INVENTIONS WERE; THE WHEEL, THE PLOW, CUNEIFORM WRITING, SCHOOLS, GEOMETRY, SAILBOATS, CHARIOTS & A HOST OF OTHER THINGS WE USE TODAY. At the southern end of the map of ancient Mesopotamia the ancient kingdom of Sumeria can be found. The ancient Sumerians were the first civilization recorded in history. The Sumerians are believed to have arrived around 3000 B.C. with an extremely advanced and civilized society. It was from the city of Ur, located in Sumer, that Abraham lived. Southern Mesopotamia lacked many resources, such as timber and metals. However, the Sumerians learned the art of irrigation. Their fields produced ample crops of barley and wheat, as well as dates and sesame. The nearby waters provided a large supply of fish as well. ELAM, SUMER, AKKAD, MARI, BABYLON & ASSYRIA WERE ALL WORLD EMPIRES LOCATED IN ANCIENT MESOPOTAMIA. THE SUMERIANS WERE THE EARLIEST KNOWN CIVILIZATION IN THE WORLD. Other empires arose in this regions; such as the Babylonian and Akkadian Empire. King Chederlaomer and his army were, in part, from southern Mesopotamia. Many empires were established throughout all of ancient Mesopotamia. Any map of ancient Mesopotamia shows kingdoms and empires which arose throughout the land, from the southernmost tip to the northernmost. The kingdoms of Elam and Sumer were founded in the south. Right north of the Sumerians, the Babylonian Empire arose. This empire, established at the very earliest of times by Nimrod, would destroy Jerusalem and the Temple under king Nebuchadnezzar in 586 B.C. Just north of the Babylonians arose the Akkadian Empire. The Mari Empire arose out of the ancient city of Mari. The Mari Tablets shed an invaluable light on ancient names and places, as well as mentioning the Habiru several times. It was from the regions of these empires king Chederlaomer subdued the kings of Sodom and Gomorrah. The Mitanni Empire surfaced near Aram-Naharaim, the land of Abraham and Terah. Perhaps the mightiest of all the ancient empires, the Assyrian Empire, was established in northeast Mesopotamia. The Assyrians were, perhaps, the most bloodthirsty and ruthless of all the ancient armies. They laid waste to the northern kingdom of Israel in the eighth century B.C. 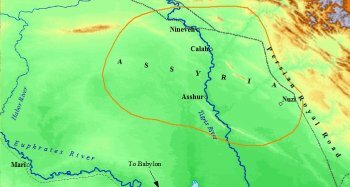 The ancient Assyrian Empire collapsed with the destruction of Nineveh in 612 B.C. Between the years of 614 - 609 B.C., the Assyrians were fully defeated. The Chaldean kings of Babylonia rose to be the sole power of all of Mesopotamia. Under Nebuchadnezzar II the Babylon Empire campaigned with much success into the West. He exiled thousands of Israelites, including Ezekiel. However, the glory of Babylon was short lived. It was a glorious reign, however short lived. Nebuchadnezzar II constructed one of the Seven Wonders of the ancient world in the Hanging Gardens. His successors, however, proved very incompetent, and the mighty empire fell with little resistance. In 539 B.C., not long after their destruction of God's Temple, the Persian conqueror Cyrus brought Babylon to its knees. Cyrus is the "Anointed One" found in Isaiah 45:1. He also allowed Ezra to return to Jerusalem and rebuild the city walls. 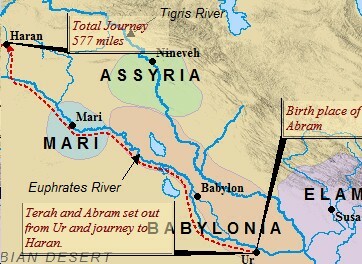 On the map of ancient Mesopotamia, to the west of Assyria, lie Aram-Naharaim. It is here the early patriarchs of Genesis sojourned frequently, and had deep familial ties to the land and the cities. Haran was named after the brother of Abraham, who died unexpectedly, leaving behind a son named Lot. 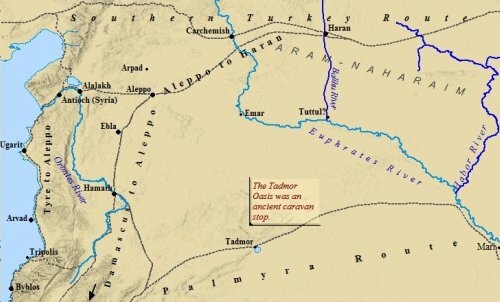 Terah settled in Haran, and it was from there Abram set out for Canaan. Abraham's servant journeyed to Haran in order to secure a bride for Isaac. Jacob fled to this area from his brother Esau. He would end up marrying the two daughters of Laban; Leah and Rachel. 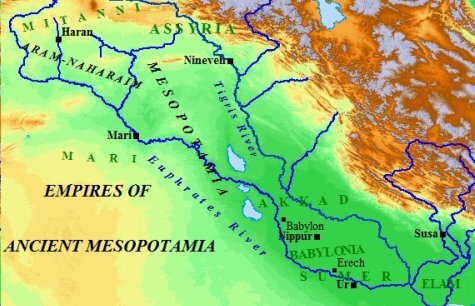 A quick glance at any map of ancient Mesopotamia, whether in the southern part of the land, in the northeast, or the northwest, the importance of the Tigris and Euphrates rivers is immediately noticed. 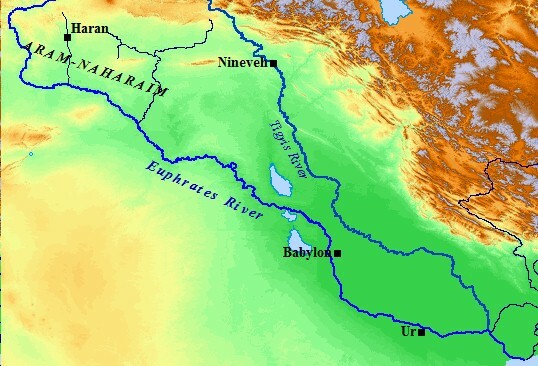 The Balikh and Habor rivers join the Euphrates at separate points, supplying the northwest part of Mesopotamia with an ample water supply. From Ur, Abraham and Terah were called by God to leave for the land of Canaan. They made it to Haran before Terah stopped. After staying awhile with his father, God finally called Abraham to leave his father's house for Canaan. The very first kingdom to make an appearance on the map of ancient Mesopotamia would be that established by Nimrod. Nimrod is believed to have built a number of cities along the banks of the Tigris and Euphrates. Among those are Babylon and Nineveh; the two great cities of the Babylonian and Assyrian Empires, respectively. Nimrod was also the architect of the Tower of Babel. It is believed by many scholars of ancient Mesopotamia that Nimrod was later deified. Indeed, his kingdom came to represent all that is against the God Almighty of Abraham, Isaac, and Jacob. 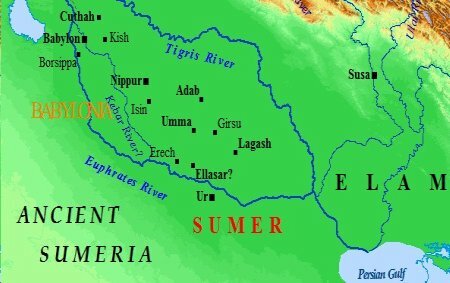 The map of ancient Mesopotamia below shows the cities Nimrod was credited as building. Along with Nineveh, he built the cities of Rehoboth, Resen, and Calah. 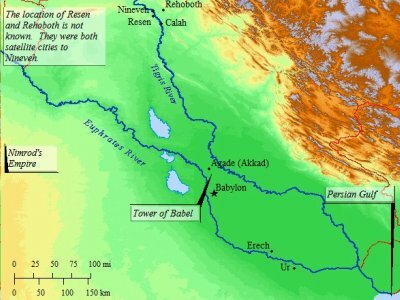 Rehoboth and Resen were satellite cities of Nineveh, yet have not been identified. Resen was said to have been built between Nineveh and Calah. These cities taken together were known as "a great city". Nimrod, in essence, became the originator of the Metropolitan area. Are you a student of antiquity? Sumeria is one of the oldest and most mysterious civilizations. The Patriarchs homeland seems to be primarily located in the northwest of Mesopotamia. This is an extremely important, and ancient, land with strong Biblical ties. Then click on the link if you want to upload up to 3 more images. All images must be in .gif or .jpg formats.